Thomas Tyldesley 1612-1651 unhesitatingly declared his allegiance to King Charles I at the very outset of the English Civil War in 1642. Indeed it is believed that Thomas Tyldesley was responsible for the first death of the conflict, with the shooting of Richard Perceval at Manchester. One consequence of Thomas Tyldesley's loyalty was that Parliament moved to sequester his estates for delinquency. This had knock-on consequences for other parties. 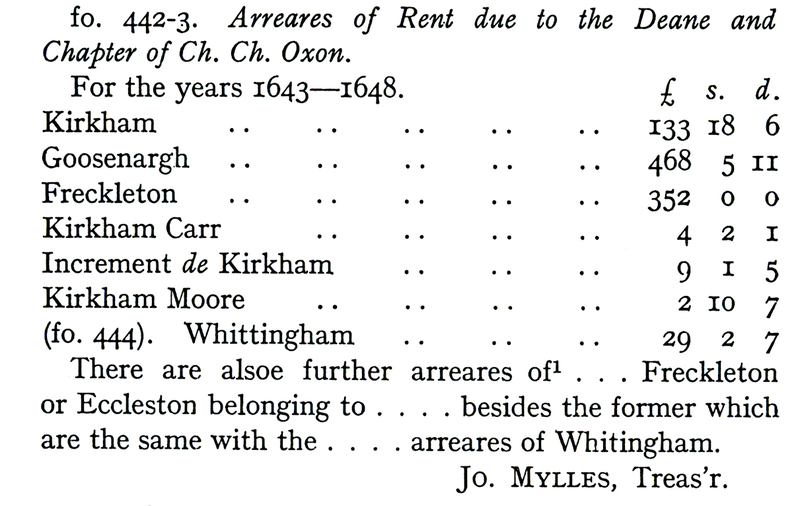 For example, Thomas Tyldesley was due to pay rent to Christ Church College Oxford in respect of the lease of the Tithes of Kirkham (the arrears of rent related to Kirkham, Goosenargh, Freckleton, Kirkham Carr, Kirkham Moore and Whittingham). By 1649 Christ Church was owed £1,031 12s 1d with complaints that it was "much in debt" and that the buildings were "much out of Repaires". G. clix, fo. 437; Cal. iii, 1943. By Command of the Committee of Complaints touchinge the breach of Articles, I am to acquaint you with the peticion whereof the inclosed is a Coppy, beinge from the Governours and Students of Christ Church Colledge in Oxford, which the Committee have taken into Consideracion together with the articles upon which they ground their Complaint; and upon the whole matter It is their opinion that all and every the tenants of he said Colledge as well in the County of Lancaster and els where ought according to the said Articles of the said Treatie to pay all such reuenues and arreares of Rents and Revenues as are due from them unto the said Colledge Notwithstandinge any restraint or order of any Committee of Parliament to the contrary, Exeptinge such rents and revenues as have been alreadie taken and received by Ordinance of Parliament. The humble peticion of the Governours and Students of Christ Church in Oxford. That by the Articles concluded upon the Render of Oxford It is expressly provided on the behalf of your petitioners that they should enjoy the lands, tenements,houses, possessions, Rents and Revenues belonginge to them (Exceptinge such Rents and Revenues as had then alreadie beene received by the Ordinance of Parliament), free from Seguestracion and all other molestacions whatsoever for or under Collour of anythinge relating to the warr: Nevertheles your petitioners' tennants, takinge advantage of the troubles and of some orders from Parliament and Direcions from the Committees made before the said Articles for payeinge their Rents unto them and not to your petitioners doe detaine theire rents in theire hands and refuse to pay them to your petitioners which is (as they humbly conceive) contrary to the said Articles. George Morley in the behalfe of Christ Church in Oxon. Haveinge the opportunity of sendinge unto you wee take the boldnes to intreate your favour and helpe in a busines which very much concerneth the estate of that Colledge wherein wee are, by the favour of the Parliament, placed to take care of the Government thereof. Christopher Rogers, Hen. Langley (and others). To the Hon'ble the Comittee of Parliament for the County of Lancaster. At the Countie 16 May, 1649. 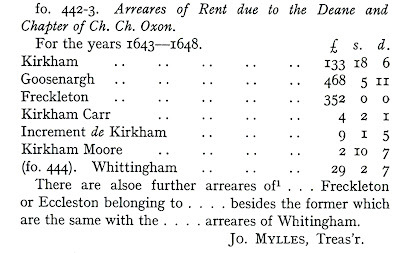 Whereas severall Orders have been issued touching the arreares of rent due for severall yeares past forth of the tythes in Kirkham parish unto the Governours and Students of Christ Church Colledge in Oxford, which tythes, beinge in lease to Tho. Clifton, esq., and Sir Thomas Tildesley from the said Colledge, have beene sequestered for theire delinquencies, And for that it appeares that the arreares due to the said Colledge till the 25th of March 1648 Amounteth to the somme of one thousand thirtie one pounds Twelve shillinges and a pennie; And for that by the Articles agreed upon at the Surrender of Oxford, afterwards confirmed by Order of Parliament, of the 23rd of June, 1646 It was agreed upon amongst other thinges in the fourteenth Article that the Governors and Students of Christ Church aforesaid should enjoy all Rents, Priveledges, Lands, tenements, Revenues, debts, Goods and Chattells belonging to them freed from Sequestracion: It is therefore ordered that the Agents for Sequestracions shall out of the profits of the said tythes as the same shall be raised satisfie and pay unto the Governours and Students aforesaid soe much of the said arreares of One thousand thirtie and one pounds, twelve shillinges and a pennie as is due and in arreare out of soe much of the said tythes for the tyme as is now under sequestracion and shall continue the payment of such parte thereof for the future till further Order.